Submission PDF isn't showing headers and text, even when the box is checked. I have tried cloning your form and checked the submission PDF after enabling the option 'Show headers and Texts'. I see that the PDF generated is displaying the headers and text normally. 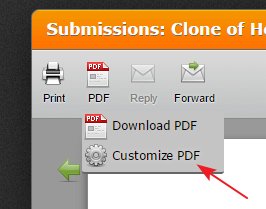 However, it is required to customize the PDF report from the Submissions view by clicking on PDF > Customize PDF icon. Please give it a try and let us know if you need any further assistance. We will be happy to assist you further. I have tried editing the customize PDF function as well. See screen shots of what my customization looks like, and then the subsequent preview. Also, I am trying to save all of the submissions from this form in one PDF file, but it seems like the customize PDF function will only do one submission at a time. 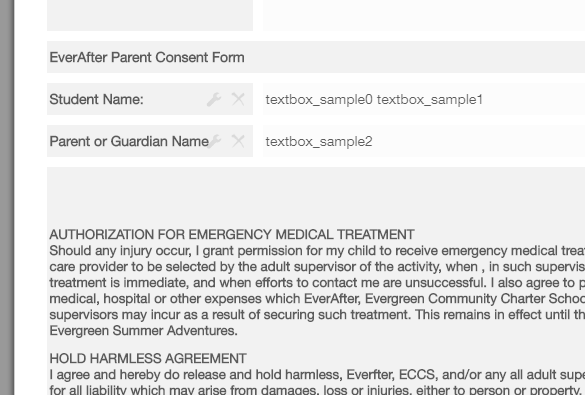 The form I'm working with right now is https://www.jotform.com/evergreenccs/everafter-parent-consent-form. For reference, another form of mine which is very similar, https://www.jotform.com/evergreenccs/ESA-Consent-form, is showing headers and text just fine. it seems like the customize PDF function will only do one submission at a time. Yes. You are right. The customize PDF function is to change the PDF report format and it shall be displaying the last received submission. 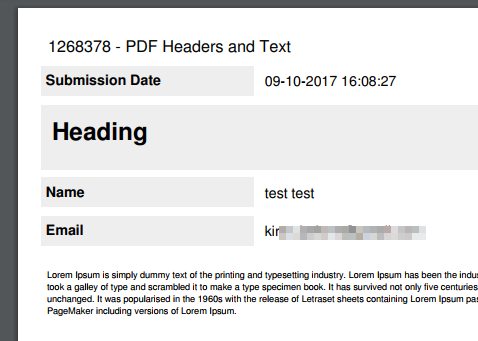 I have tried creating a new form in my account and see that the headers/text not being sent to PDF report after enabling them. Though I was able to replicate the issue at my end initially, it looks like the issue is now resolved. The report is now displaying the Headers and text normally. Please try removing the PDF reports from the Reports drop-down and then try generating a new report to see how it works. Please get back to us if the issue still persists. We will be happy to assist you further.